In this case, the "she" is actually a "he". That "he" is Pittsburgh Penguins' winger, Conor Sheary (well look at that, I made a rhyme). Conor Sheary is on fire right now and it seems he can do no wrong. In just this month alone, he has eight goals which puts him tied for the league lead with the New York Islanders', John Tavares. Six of those goals came within the last week. During his tear, which included points in all four games played, Sheary had a league-best nine points (6G/3A), helping the Pens go 4-0 for the week. Sheary's four- game point streak equalled his career-long run. Numbers like that were enough to have Sheary named First Star of the Week by the NHL. The Little Penguin That Could is shocking the NHL with his play. Now a Stanley Cup Champion, Sheary currently has 17 goals on the season which is good for a total of 39 points overall. Should he continue at this pace, Sheary could go on to amount over 30 goals, something not done by any Penguins winger since 2013-2014. That player is (still) current Penguin winger, Chris Kunitz (35 goals). 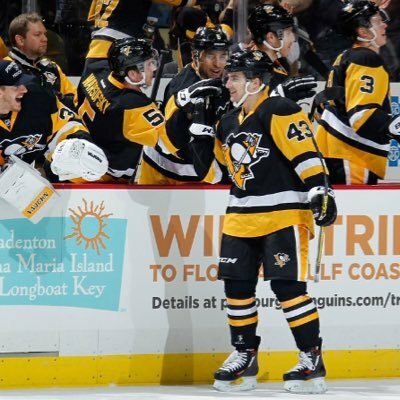 Sheary is currently sitting at 12th league-wide for average goals per game with 0.44. He is listed as 20th in overall points per game at 0.87.